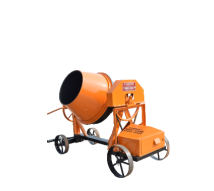 WHAT ARE DIFFERENT TYPES OF CEMENT CONCRETE MIXERS? Transit Concrete Mixers are mobile road driven vehicles with the capacity of weighing, loading and mixing of concrete while on the move. This features makes self loading concrete mixers very easy and efficient to use anywhere. Sand, cement & aggregates can be loaded from a different location and transported to wherever it is required, while the cement is being mixed during transportation. All this is done by a single operator. Industrial projects require mass concreting type of mixers. 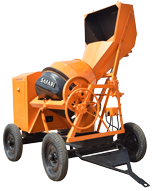 SAFARI manufactures reversible drum concrete mixers to meet this requirement. 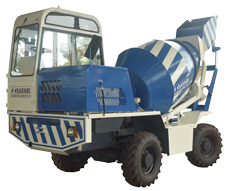 SAFARI 3000 also known as RM 800 produces concrete at the approximate rate of 12 cubic meter per hour, while SAFARI 5000 also known as RM 1050 has output of 15 cubic meter per hour. SAFARI 2000 has capacity of 8 cubic meter per hour and is best for easy transportation. Engine powered mixers are required in remote areas due to unavailability of electricity, especially where new construction of roads & bridges is taking place. These are stationary while mixing and production of concrete takes place, but can be moved around from site to site or within a site using its towing system and tyres. 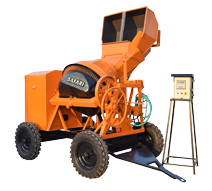 These one bag / sack mixers have a tilting drum of 450 litres and can mix one bag of cement at a time and are used for small housing projects or repair works. They can be easily towed behind a pick up or small tempo and hence are very mobile. 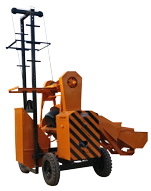 These are specially designed 10/7 one bag (sack) type of mixer machine with lift and tilting drum which can also lift the mixed cement concrete mixture upto 55-65 feet of height. 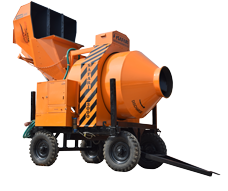 This dual operation is very beneficial to customer cost wise and hence is very popular in small concreting jobs of 4 floors to 5 floors for slab work and other concreting needs of low-rise buildings. 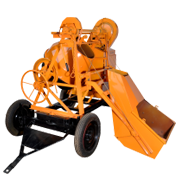 Half bag mixers are very portable type and can be easily moved around. They can be electrically or diesel operated. How much does a Concrete Mixer Machine Cost? Pricing and rates of concrete mixers is varied and highly dependent on type and quality of material used in manufacturing. Pricing depends on the various configurations like the number & size of tyres, drum type & size, engine or electric operation, digital or manual operation. Price range starts from 35000 and the cost can go upto 10,00,000 or more. 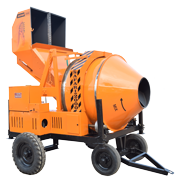 Out of total production of concrete mixer machines manufactured, fifty percent is exported while the rest is consumed domestically in India. 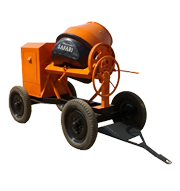 Safari Construction Equipments manufactures a variety of high quality concrete mixers in different types, capacities and in different price range to suit all customer’s requirement. Currently, Mixer Machines are exported to Sri Lanka, Kenya, Tanzania, Ghana, Nigeria, South Africa, Zambia, Oman, Saudi Arabia, Fiji Islands and other African, Middle East & Asian countries. How does a concrete mixture machine work?